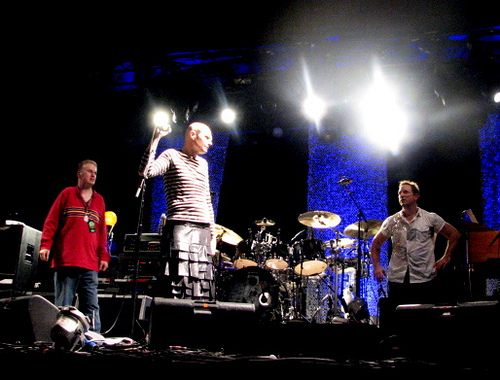 The Smashing Pumpkins song “Spaceboy” off the Siamese Dreams album was written by Billy Corgan about his half-brother Jesse Corgan (on-stage in the red shirt). Jesse was born with mild cerebral palsy that caused him to walk on his toes, and Tourette’s syndrome (a neurological disorder that can cause nonsensical or uncontrolled speech). He also had heart problems and a chromosomal disorder that caused him to be slower than the other children. The two remain close as Jesse joined The Smashing Pumpkins on stage in Chicago in December 2008. “That’s about my little brother. He’s an interesting character. It’s kind of about how he’s different. He has physical handicap, it’s hard to explain. He has a rare chromosomal disorder, it gives him a some what different genetic make up. He has different physical and mental problems and yet somehow by all accounts, I’m physically and mentally OK. But I feel our lives are the similar. (Similar in the way that we are both) Freaks of nature, freaks of society, I always keep going back to something by Henry Miller. No matter how much he smiled, told jokes, shook hands, patted people on the back. People still looked at him funny, they still sensed something wasn’t right. I’ve always felt that way, that no matter how normal I appear, I was treated differently.